We often don’t realize how much we use our necks until they are aching and stiff. There are many reasons why your neck may hurt, but we can all agree that we want that pain to go away as soon as possible. Gentle stretches that can be done at home may be a good way to find relief from your neck pain. 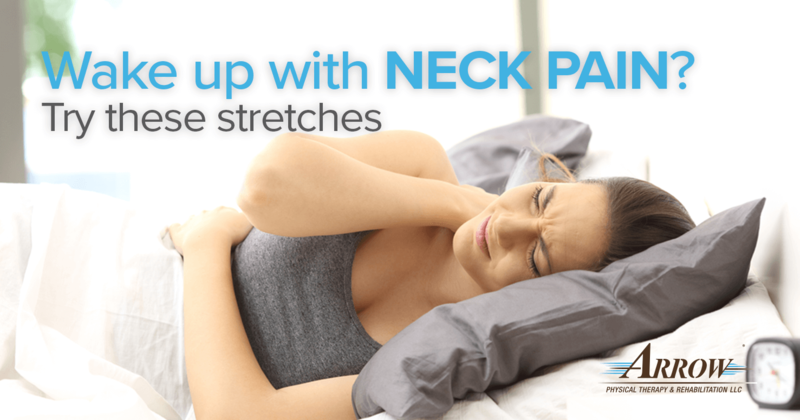 If you are experiencing stiffness and other symptoms associated with neck pain, try these gentle stretches at home. If at any time these stretches cause discomfort or pain, stop immediately. If the pain does not go away after a few minutes contact your doctor. For neck pain that lasts longer than a few days, schedule an appointment with a doctor who can review your symptoms and create a treatment plan for your pain relief. At Arrow Physical Therapy and Rehabilitation, our team of physical therapists works with each client to create personalized treatment plans to relieve neck pain and other common pains associated with aging and injury. We have offices in Woodbridge, Edison and Union, New Jersey. These three gentle stretches may help to loosen the neck muscles and relieve neck pain that is caused by muscle strain or tension. Move through these stretches slowly to avoid injury, and stop at the first sign of pain. Neck Tilt – While sitting in a chair, bring your chin to your chest and hold it there while you count to five, and then bring it back up. Repeat four more times. Side to Side Neck Tilt – Again, while sitting, try to touch your left ear to your left shoulder. Hold the position while counting to five, and then bring your neck back up. Do the same thing on your right side. Repeat for a total of five times for each side. Neck Stretch – While standing straight, bring your chin forward and keep it there while you count to five. You should feel pressure in your throat. Bring your chin back to where you began, and then bring it backwards and keep it there as you count to five. Repeat each action for a total of five times for each. Remember to think about your breathing as you complete each of these exercises. As you move through these stretches, the muscles in your neck should loosen, causing the pressure on your nerves to release and thereby relieve your pain. However, if you pain continues after a few days of repeating these stretches, you should contact a doctor to receive a professional diagnosis for the cause of your pain and a treatment plan for neck pain relief. Neck pain can usually last for a few days or even a couple of weeks depending upon the cause of the strain. If your neck pain is severe, and accompanied by numbness or tingling in your arms or hands, contact a physical therapist or other medical professional to receive treatment. Our team of physical therapists at Arrow Physical Therapy and Rehabilitation wants to help you find relief from your neck pain. If you are in the Woodbridge, Edison or Union area of New Jersey, and you are experiencing chronic neck pain, contact our physical therapy office near you today to schedule an appointment today. You can also fill out the appointment request form on our website. Let us create a personalized treatment plan to get your back to your normal lifestyle without being limited by neck pain. Contact us today.